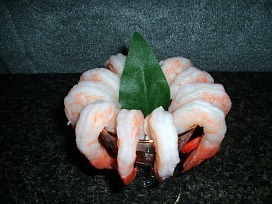 When you learn how to make shrimp appetizer recipes you will find one of the favorites is a simple shrimp cocktail. When I was young that is the only one I can remember. Boy have we come a long way! Back then, when one of my older brothers, Donald came home from the military we would have shrimp. He was really hooked on it! At home we never ate it and I didn’t even know what shrimp was. Finally Donald convinced me to try it. Now I love it, no matter how it is served. When you lean how to cook seafood you will learn the most popular of the shellfish is shrimp; we eat more than ten times the shrimp as other shellfish. 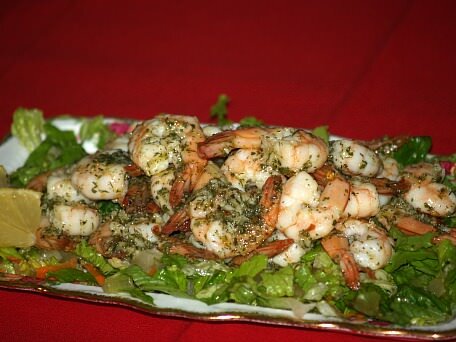 This popularity also holds true when it comes to shrimp appetizer recipes. Many of these recipes are light (and light in calories) which are great preceding large meals. Today other ingredients are added in the shrimp recipes like various types of cheese; these add a lot of calories but also make the recipes very delicious. Shrimp can be purchased uncooked and unshelled, cooked in the shell, cooked deveined without shell, canned, frozen or partially prepared then frozen. Whichever way, there is a convenient choice for your recipe. The most basic shrimp cocktail is my favorite of the shrimp appetizer recipes. For each serving allow 6 large cooked shrimp with the tails still on. Some people place the shrimp in a cocktail glass and pour the cocktail sauce over them. I prefer the shrimp hanging on the rim of the glass with the cocktail sauce in the bottom of the glass. This allows dipping of the shrimp by the tails to have as much of the sauce that you like; some like the shrimp plain without the sauce. This way of serving accommodates all guests. 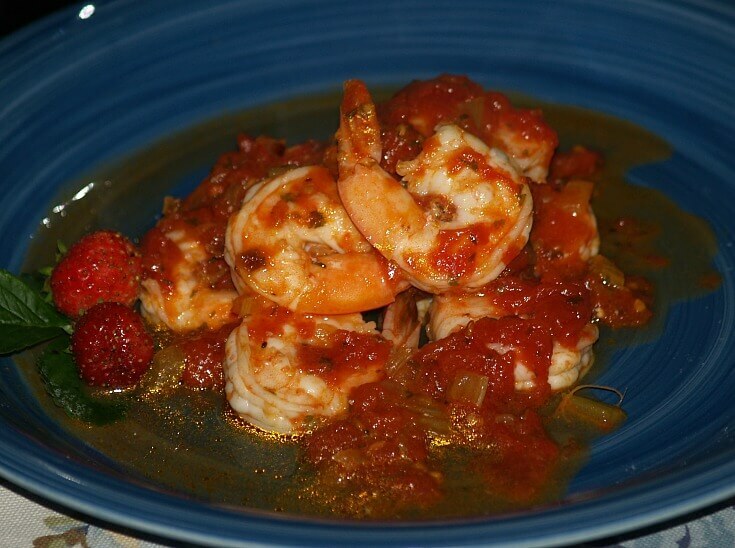 A spicy shrimp appetizer recipe. Combine all ingredients in a large bowl with a lid. Cover tightly with the lid and refrigerate for a couple of hours. Learn how to make shrimp appetizer recipes which are hot and spicy. In a large skillet sauté onion, garlic and jalapeno pepper in olive oil until tender. Add salsa and wine; simmer until thoroughly heated. Add the shrimp and cook until hot. To serve place shrimp on individual plates; spoon a little sauce over the top. Learn how to make shrimp appetizer recipes with this easy recipe. Combine and blend mayonnaise, cream and ketchup in a bowl. Stir in Tabasco sauce and lemon juice. Spoon mayonnaise sauce in bottoms of small bowls. Arrange cooked shrimp around edge of bowl. Garnish with parsley or herb leaves and lemon slices if desired. Makes about 4 to 5 appetizers. 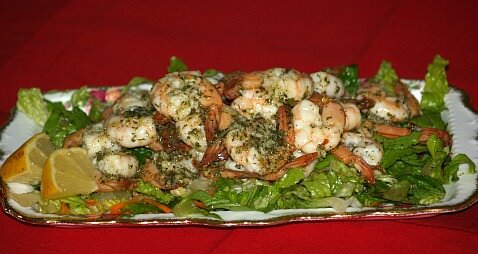 NOTE: People love shrimp so the amount depends of other appetizers and dishes served. Rinse shrimp in fresh water and pat dry with paper towels; set aside. Combine milk, egg and pineapple juice in a bowl; set aside. In shallow dish combine flour, coconut, cornmeal and tortilla chips. Dip shrimp in milk mixture; coat with flour mixture. Heat oil about 1 ½ inch deep in large fryer. Drop breaded shrimp in hot oil without crowding; cook until golden brown. Serve hot with Pina Colada Sauce on the side. COMBINE and mix all ingredients; chill before serving. Learn how to make congealed salad recipes like this one; they are favorites in many parts of the world. Put gelatin in the cold water and mix to blend. Add the gelatin mixture to the tomato mixture. Stir in the celery, mayonnaise and shrimp. Put in a mold and refrigerate overnight. Serve with crackers or wafers. Grind the shrimp and onion. Add the sour cream, cream cheese and Worcestershire sauce to the onion mixture. Beat until well blended and serve with potato chips. 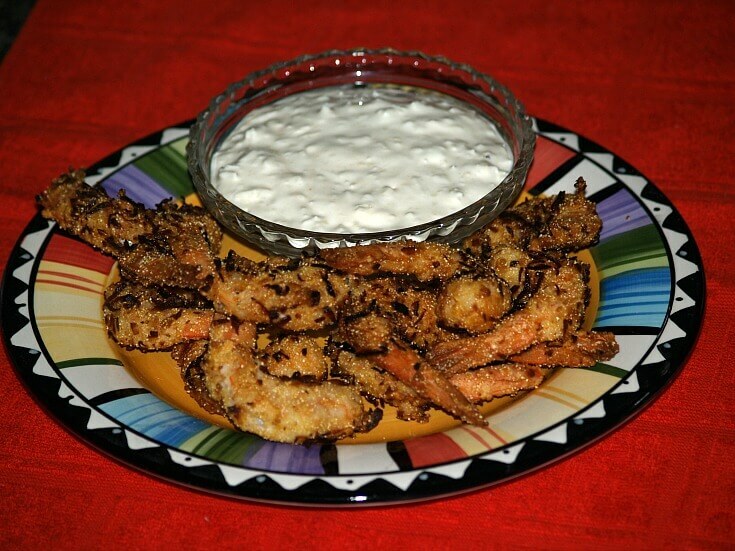 This shrimp appetizer recipe is a favorite for New Year's parties and Christmas parties. Mix together the shrimp, cream cheese and onion. Shape into a ball and make a dent in the center. Fill the dent with the cocktail sauce allowing it to run down the sides. Refrigerate overnight and serve with crackers. Combine the shrimp. water chestnuts and onion; mix together. Stir in the soy sauce and mayonnaise. Refrigerate about 6 hours and serve with crackers. Drop shrimp in the boiling water with the celery tops and pickling spice; boil 6 minutes. Clean and shell shrimp and make a layer in the bottom of a flat bottom refrigerator container with a lid. Top shrimp with the bay leaf and sliced onion. Mix together the salad oil, vinegar, salt, celery seed capers and Tabasco sauce; pour over the onions. Cover tightly with lid and refrigerate for 24 hours. Remove shrimp from sauce to serve. Learn how to make shrimp appetizer recipes with caviar. Marinate the shrimp in the French dressing for 1 hour. Mix mayonnaise with lemon juice; spread on toast rounds. Place shrimp flat side down on the toast rounds. Place a little caviar inside the curve of the shrimp. Garnish each toast with a tiny sprig of parsley at head of shrimp. Learn how to make shrimp appetizer recipes; easy and quick. Arrange shrimp on baking sheet; both sides flat on tray with tails left on. Brush shrimp generously with olive oil; sprinkle with bread crumbs. Place under broiler for 5 minutes; brush with Dijon sauce.